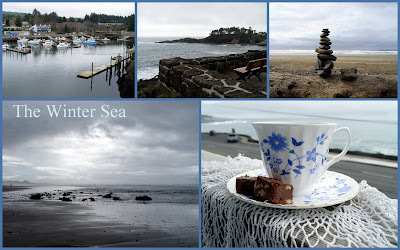 Have you noticed how the winter sea is always BLUE? As close as I am to the sea, I rarely see it in winter. If you say that it is always blue, I'll believe you. Gorgeous photos! I love the teacup and fudge. Is this your traveling teacup? I am wondering about taking my traveling teacup on my next adventure. Trying to travel light, but I might not be able to leave it at home. Oh, now I'm 'homesick' for the Oregon Coast, especially Bandon. We visited again last summer and find we need to return again. Often! Love the teacup. I MUST remember to select a traveling teacup. And I MUST remember to take it with me!